It’s surprisingly hard to read split cards online. I prefer to actually hold them in my hand and be able to turn them sideways, but such are the requirements of following Magic in the days of Web 3.0 or whatever we’re up to! Both sides of this card are pretty straightforward, but both are also pretty powerful. Some people will still be blindsided by a Giant Growth analogue that comes from open red or white mana – I personally still play with Brute Force from Planar Chaos sometimes, but it takes some getting used to for some people. The other half is, of course, Warleader’s Helix, and it’s still twice as expensive as City of Guilds’ Lightning Helix, but in this case you have the versatility of Integrity which can sometimes be an effective removal spell or extra damage spell when you’re either too early or too short on mana for the Helix. I expect this to be an easy card to add to aggressive and midrange creature decks. More Ravnica means more hybrid mana and more split cards. And when it comes to Guilds of Ravnica, it means both on the same card! As a quick reminder, you can only cast one of the two halves at one time; the value of split cards is in how they compress slots and pack more value into a single card. The split cards here have an affordable hybrid half that serves as a small-ish trick and a bigger multicolored half. 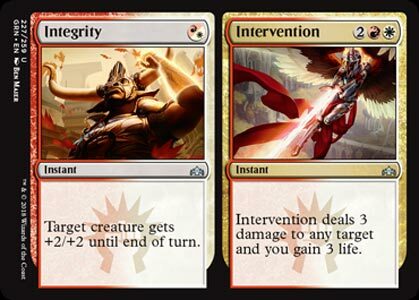 Response is a simple +2/+2 for one mana, which is a good deal (particularly since red rarely gets +X/+X and white rarely gets it to one creature). It’s not a flashy card, but having the option to use it to get a bit of a burst of damage in or suddenly win a trade in a pinch is the value of it. But if your creatures win already, Resurgence is there to act as a bit of removal. It’s Lightning Helix at the price of Warleader’s Helix…but even at 4 mana, a six-point swing is always good, particularly one that doubles as removal. Four mana is less good, but you’re paying for the efficiency of this card. I don’t know how much play this will see, but flexibility makes these cards better than they look at first, and some of them will perform well. And the appeal of an overpriced Lightning Helix may still be more than enough to get this to work well.